Samsung Galaxy SM-R600 Gear Sport - Blue; 1.2" Super AMOLED capacitive touchscreen; Corning Gorilla Glass 3; 50m Water Resistant Copyright © 2019 ComXpert International CC - COPYING IS ONLY ALLOWED FOR THE PURPOSE OF SENDING US ENQUIRIES. E&OE. If swimming is your sport of choice or you get caught running in the rain, keep going. The Gear Sport has a water-resistant rating of 5ATM or 50 meters, meaning even in the deep end, your activity is recorded. * Then you can sync with Speedo On, Speedo’s new Swim Tracking app, and dig into the details. ** *Gear Sport has a water resistance rating of 50 meters under the ISO standard 22810:2010. It is not suitable for diving or high-pressure water activities. If the device or your hands are wet, they must be dried thoroughly prior to handling. **The Speedo On app must be downloaded separately. Availability of the Speedo On app may vary by country or region. The best price and guaranteed service and backup from official computer suppliers in South Africa for the SAMSUNG GALAXY SM-R600 GEAR SPORT - BLUE Samsung Galaxy SM-R600 Blue 1.2" Gear Sport Smart Watch. The Samsung SAMSUNG GALAXY SM-R600 GEAR SPORT - BLUE Samsung Galaxy SM-R600 Blue 1.2" Gear Sport Smart Watch is available for R3685. The product is sold by ComX Computers as new. Prices are valid today 2019-04-18 (before 2019-04-19 , by quote, while stocks last). The product is expected to be in stock, although this is not guaranteed. Find related SAMSUNG GALAXY SM-R600 GEAR SPORT - BLUE Samsung Galaxy SM-R600 Blue 1.2" Gear Sport Smart Watch products in our Smart Watches Category for even more options. 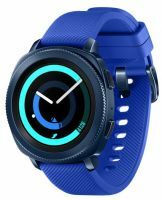 Read reviews and find out about SAMSUNG GALAXY SM-R600 GEAR SPORT - BLUE Samsung Galaxy SM-R600 Blue 1.2" Gear Sport Smart Watch. Discounts, specials and cheap prices only at ComX Computers.